Mixing new school with old, comics publisher Lion Forge Comics has partnered with IDW Publishing to bring the classic TV series Miami Vice to print with Miami Vice Remix this February. The work pairs writer Joe Casey with illustrator Jim Mahfood in a comic that follows the Metro-Dade Police Department detectives Sonny Crockett and Ricardo Tubbs through modern-day Miami as they go undercover facing dangerous encounters with voodoo, zombies and Crockett’s mysterious past. Miami Vice Remix is the latest Lion Forge title crossing over from digital to hard copy through IDW. The comic joins licensed and celebrity titles Rampage Jackson: Street Soldier and Saved By the Bell. Miami Vice Remix #1 (Diamond code JAN150433) will be available at your local comic book stores February 2015. Full press release below. SAN DIEGO and ST.LOUIS (Dec. 10, 2014) – Mixing new school with old, comics publisher Lion Forge Comics has partnered with award-winning IDW Publishing to bring the classic TV series “Miami Vice” to print with Miami Vice Remix this February. Now anyone who loves the iconic characters, pastels, fast cars and over the top action of “Miami Vice” can get their hands on the comic based on the renowned ‘80s classic television show. 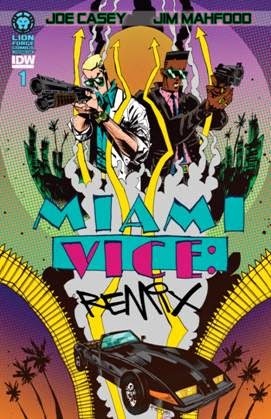 Writer Joe Casey (Uncanny X-Men, Adventures of Superman) teamed up with comic book industry veteran Jim Mahfood to create Miami Vice Remix. The comic follows the Metro-Dade Police Department detectives Sonny Crockett and Ricardo Tubbs through modern-day Miami as they go undercover facing dangerous encounters with voodoo, zombies and Crockett’s mysterious past. Miami Vice Remix is the latest Lion Forge title crossing over from digital to hard copy through IDW. The comic joins licensed and celebrity titles Rampage Jackson: Street Soldier and Saved By the Bell, which also is based on hit NBC television series. Miami Vice Remix #1 will be available at your local comic book stores February 2015. Lion Forge is a St. Louis-based transmedia studio with a focus on digital publishing. With both original and licensed titles, including all-ages books from their ROAR Comics division, Lion Forge brings together the brightest talent to acquire and develop content and character franchises within the comic book, television, film and interactive gaming industries. Lion Forge applies cinematic elements to each property to create compelling, story-driven experiences from start to finish, bringing unique entertainment experiences to both traditional and digital marketplaces. For more information, please visit www.lionforge.com or the Lion Forge Facebook and Twitter pages.